Hope­fully, the anatom­i­cally incor­rect sauropods don’t sully the strip for you! I am saying this mainly to let you know that I am aware of the mis­take, so let us never speak of it again. Unless it comes up in con­ver­sa­tion. You know, I should start car­ry­ing a sign that reads “ARTIS­TIC LICENSE” and try to use it to win argu­ments. Much to my pleas­ant sur­prise, Goril­laz has released a new single. You should listen to it if you like Goril­laz and the music that they make. Also, hot damn, this sto­ry­board sequence sure is tan­ta­liz­ing. Basi­cally, I am here today to tell you that I like Goril­laz. Is Donly alive… in the “present”, I mean? Where’d Milo get the goggles… and the laser gun? Doesn’t past Milo now have to go to that time and shoot Donly? But then he wouldn’t be able to say that Donly went on for 20 min­utes. Unless future Milo does it. ??!!?!!?!?!??!??!?!!!!?!!?!?!?!! Sorry I just broke my brain. So…Milo goes to the party twice? once in the past, once in the future BUT IT’S THE SAME PARTY! At least Milo only *stuns* Donley, instead of killing him. Those dinosaurs look pretty stunned, too! Maybe they’re con­tem­plat­ing the time para­dox cre­ated by having two Milos in the same place and time. Yes, just to clarify—no one is dead! 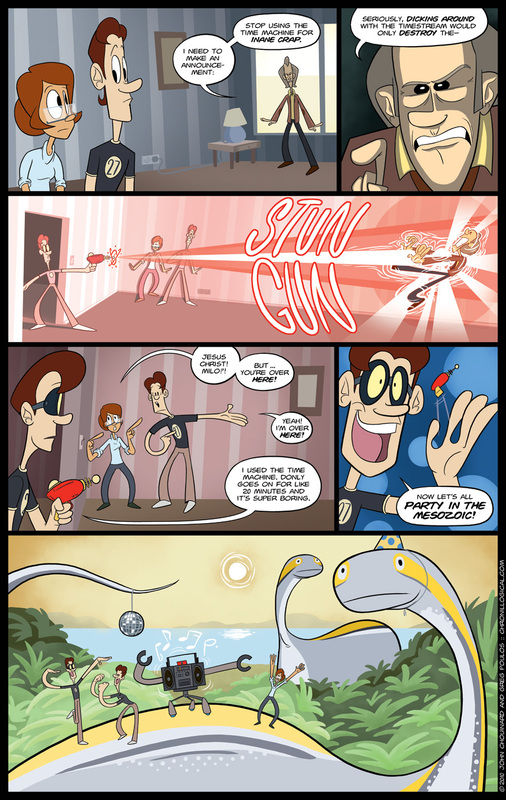 It seems I missed the words “Stun Gun” in panel 3. Well, good thing Donly is okay, but the ques­tion is still open about what’s going to happen with two Milos……..
It’s not so much the anatomy but the color of the sauropods that sul­lied this strip for me- every­body knows that they (or at least the par­tic­u­lar species you pic­tured) were a subtle brown-​gray with­out those ridicu­lous yellow stripes (although I sup­pose their belly could be called a shade of yellow). Recent chrono­log­i­cal expe­di­tions into the Meso­zoic back me up in this regard; for such a time-​themed comic, I am offended by your col­lec­tive lack of research! Also: I went to see the Goril­laz per­form live in Austin, and it rocked very hard. Omega’s right–every­body knows that sauropods didn’t gen­er­ally wear disco balls and party hats. They usu­ally wore skull caps and tail pins. Haha this is prob­a­bly my favorite strip. It’s just so ridicu­lous. I loved the orig­i­nal sto­ry­line you’d devel­oped, and was really into it and wish it had gone fur­ther, but it was enough to make me care about the char­ac­ters and the sub­se­quent random shorts are fun. Also the art’s clearly get­ting more styl­ized, very cool to see that sudden shift, what with the breaks taken. Thanks for your com­ments! Even though we’re not updat­ing any­more, it’s nice to see people come across the comic and see what they think after the fact. I really like this strip, too, and I remem­ber John and I having a fun time coming up with it.